Miami – July 7, 2017 – The Association for the Study of the Cuban Economy (ASCE) will hold its 27th Annual Conference at the downtown Miami Hilton (1601 Biscayne Boulevard) July 27-29. Titled "Cuba: Navigating in a Turbulent World," the three-day event will focus on evaluating the state of the Cuban economy, taking into consideration the impending changes in Cuba's relations with the United States. The conference program will feature scholarly individual presentations and roundtable discussions by world-class experts, including specialists from the island. "With Venezuela's collapsing economy, one of the key issues to be discussed at this year's conference is the future of Cuba without Venezuelan trade and subsidies," says Helena Solo-Gabriele, Ph.D., ASCE president and an engineering professor at University of Miami. "Another key issue is whether Cuba will implement the economic reforms needed to stimulate the private sector and attract foreign investment to spur economic growth." ​Cuba's dual currency system, current economic policies, and prospects for future growth and change will be covered at the conference, together with social and legal issues related to the economy. This year, there will be two sessions dedicated to legal issues in Cuba titled "Foreign Investment in Cuba: Law, Policies, and Practicalities" and "Coordinating U.S. and Legal Principles to Resolve Property and Damage Claims." Continuing law education credits are available for both sessions. Additional topics include tourism, real estate, and agriculture. An impressive roster of presenters who have been chosen based on the quality of their paper submissions include keynote speaker Marc Frank, a journalist working in Havana for Reuters and "Financial Times," and author of "Cuban Revelations: Behind the Scenes in Havana." Others include faculty from many esteemed universities in the United States and experts from the International Monetary Fund, World Bank, U.S. Department of Labor, and U.S. Department of State. Special guest presenters who will be able to travel from Cuba include leading economist Omar Everleny Pérez Villanueva who will speak about economic anticipations on the island; intellectuals Dagoberto Valdés Hernández and Yoandy Izquierdo Toledo, both from Centro de Convivencia, who will speak about Cuba's education system and its impact on the economy; Dr. Alina Lopez Hernández, a philosophy professor and essayist, who will speak about the realities of the Cuban economy; top journalist Ernesto Perez Chang of Cubanet News who will speak about journalistic interpretations of Cuba's economy; Dr. Olimpia Gómez Consuegra, an agricultural engineer and a member of the Cuban Academy of Science until 2011 who will participate on a panel about agriculture; Laritza Diversent, a lawyer, independent journalist and human rights defender who will discuss the struggle to establish independent civil society organizations; and Joanna Columbié, an activist with Academia del Movimiento Politico Somos + who will also touch on the struggles of independent civil society. Sessions by these guest presenters will be conducted in Spanish. "We aim to gauge the state of the Cuban economy with scholarly discussions and research where the participation of intellectuals in Cuba is very relevant," said Solo-Gabriele. "With this valuable exchange, we are creating a rich body of knowledge that supports ASCE's mission of promoting scholarly discussion on the Cuban economy." In addition to scholars and professionals, the conference will feature a graduate and undergraduate student panel with papers addressing Cuba's housing sustainability, the influence of foreign policies, and even the influence of foreign fashion on the Cuban identity. Student papers were judged by a panel of experts and the winning students will receive a modest scholarship award plus travel funds to participate in the conference. These students are represented internationally from the U.S., the Netherlands, and Belgium. "We are very appreciative of the financial support received from the Christopher Reynolds Foundation for the student paper competition and the Cuban scholar travel plans," says Solo-Gabriele. "Cuba: Navigating in a Turbulent World" will open on Thursday, July 27th with two plenary sessions after an 8 a.m. breakfast; concurrent sessions will follow lunch and will dominate the Friday and Saturday programs. While a cocktail reception will take place on Thursday after the conference, an ASCE business meeting will be held on Friday at 6:45 p.m. The event closes on Saturday at 12:45 p.m. with two concurrent sessions. For more information on this conference, go to www.ascecuba.org. To register, go to http://www.ascecuba.org/2017-asce-conference-registration-form. The Association for the Study of the Cuban Economy (ASCE) is a non-profit, non-political organization incorporated in the state of Maryland in 1990. With members from the US, Latin America and Europe, its mission is to promote research, publications, and scholarly discussion on the Cuban economy in its broadest sense, including on the social, economic, legal and environmental aspects of a transition to a free market economy and a democratic society in Cuba. ASCE is committed to a civil discussion of all points of view. Affiliated with the American Economic Association and the Allied Social Sciences Association of the United States, ASCE maintains professional contacts with economists inside Cuba –whether independent or associated with the Cuban government-- who are interested in engaging in scholarly discussion and research. 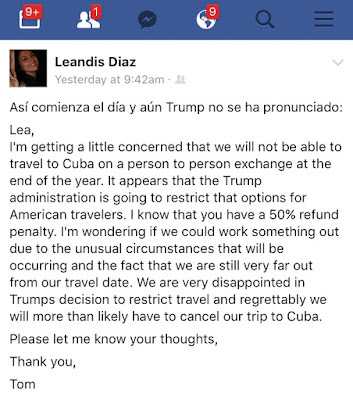 At 9:42 a.m. yesterday almost 4 hours before President Donald Trump took the stage in Miami's Little Havana a good friend of mine got this cancellation for her BnB across the waters in Old Havana. Tell me again how the new Trump-Rubio-Díaz-Balart measures will help Cuba's cuentapropistas? Join me on a completely legal group P2P trip to the new #Cuba! If you want to know my take on the new Trump Cuba regulations you can check out my Facebook or Twitter timeline (@elyuma). However, after reviewing those new regulations I realize that he and Marco Rubio just threw some new business my way! I was already scheduled to be the on-board educator for a 10-day people-to-people educational and cultural cruise to Cuba in late December. The Trump policy ratifies the basic legality of those trips, so contact me if you want to join. Additionally, I'm scheduled to lead a group people-to-people tour to Cuba in early January. We currently have 6 travelers but given the fact that by then individual people-to-people travel will be outlawed, I realize we may get a surge of interest in joining our fully legal group visit. So contact me if you're interested in joining me and our other happy travelers. Rest assured that every effort will be made to spend our hard earned currency in private sector establishments (including private BnBs and paladar restaurants) which has been my policy for > 20 years now. We look forward to seeing the final details of the President's policy, but our initial assessment is that it is largely consistent with our recommendations to the White House. We thank the President for recognizing the rights of Cuban Americans to freely visit and send remittances to their families. This is a strong victory for the Cuban American community, the Cuban people, and our organization. We were also encouraged to learn that Americans can continue traveling to Cuba individually so long as they stay in Cuban family homes and directly support the private sector. While it remains to be seen how the regulations are written, this general approach would be welcomed news for the island's young entrepreneurs and small businesses if it does not prevent Americans from visiting the island. As we said in our letter to the President, kitchen table diplomacy works and there are no better ambassadors for our values than the American people. We also applaud the President's decision to maintain our diplomatic mission in Havana. The U.S. will continue to be better positioned to advocate its values and engage Cuba on important issues, such as human rights and lowering passport fees that penalize low-income families. We're also encouraged by the White House's indication that U.S. technology and telecommunication companies may continue supporting the Cuban people's access to information and the internet. CubaOne remains committed to working closely with the Administration and members from both parties on U.S.-Cuba policy. For us, Cuba is an issue where there is no such thing as political parties—it's about our families, our community, and the Cuban people. Your passion to help female entrepreneurship around the world has been very inspiring for Cuban entrepreneurs. As women entrepreneurs in Cuba, it is a great honor to send you this message. We are reaching out to introduce you to our reality and to strengthen the relationship between our countries. We also write to you with great concern U.S. policy toward Cuba might be headed backward, in turn threatening our economic livelihoods and the overall well-being of Cubans on and off the island. Can we afford to lose $6.6 billion in revenue and 12k jobs?! WASHINGTON, D.C. - Today, Engage Cuba led a coalition of business groups, economists and leading Cuba experts in releasing an economic impact analysis estimating that a reversal of Cuba policies would cost the U.S. economy $6.6 billion and affect 12,295 American jobs over the course of the first term of the Trump Administration. Obama Administration policies to loosen regulations on U.S. companies interested in doing business in Cuba have contributed to significant economic growth and job creation throughout the country. The economic impact analysis was released on the heels of reports that the Trump Administration is set to roll back Obama-era Cuba policies, despite an ongoing inter-agency review that largely favors expanding travel to and trade with Cuba and concerns from U.S. military experts that reversing progress with Cuba would threaten U.S. national security interests. Rural communities across the country most reliant on agricultural, manufacturing, and shipping industries would be disproportionately affected by adding regulations on travel and trade to Cuba. This analysis excludes agricultural and medical exports because provisions allowing for limited exports in these sectors were authorized by Congress in 2001, thus predating Obama-era regulatory changes. However, new regulations on exporting agricultural commodities to Cuba could cost an additional $1.5 billion and affect 2,205 jobs more U.S. jobs. Given their deep water ports and proximity to Cuba, imposing regulations on Cuba would particularly threaten economic growth and job creation in the Gulf states, including Florida, Louisiana, Texas, Alabama, Georgia and Mississippi, all of which supported President Trump in the 2016 election. "Our new relationship with Cuba has led to tangible results for American companies, created U.S. jobs, and strengthened Cuba's growing private sector. If President Trump rolled back our Cuba policy, he would add job-killing government regulations on U.S. businesses. This directly conflicts with President Trump's campaign promises of removing onerous regulations and red tape on U.S. businesses," said President of Engage Cuba, James Williams. "Reimposing restrictions on traveling to Cuba would force Americans to jump through even more bureaucratic hoops to exercise their right to travel freely." "How sadly ironic and short-sighted it would be if, soon after singing the praises of the repressive leaders of Russia, Egypt, Turkey and Saudi Arabia, President Trump were to return to a failed 55-year-old policy of sanctions and ultimatums against tiny Cuba," said U.S. Senator Patrick Leahy (D-VT). "Rather than cave to the pressure of a dwindling minority who are stuck in the past, he should go to Cuba and speak directly with the Cuban people on behalf of the overwhelming majority of Americans who favor closer relations. He would see that the current policy has given the Cuban people real hope for a better future, a future that is naturally linked to the United States and the American people." "In the past two years since President Obama announced his policy of opening up to Cuba, we've seen economic exchanges, investments and jobs growth in the U.S. and in Cuba's private sector. For a jobs-focused President, to reverse these jobs creating reforms, especially one that affects many of the agricultural states that voted for him, makes little economic sense and no political sense," said Christpher Sabatini, a Latin America specialist and executive director of Global Americans. "Ending economic ties and killing U.S. jobs won't improve human rights in Cuba; continuing engagement and expanding those job opportunities--on both sides of the Florida Straits--will." Dozens of U.S. businesses in almost every sector have begun exploring opportunities for expansion into Cuba. The four major U.S. telecommunications providers now offer roaming on the island, and Google will now allow fast and easy access to its online services. U.S. travel to Cuba has skyrocketed. As a result, seven U.S. airlines fly direct to Cuba and three cruise lines have reached deals. American travel giants including AirBnb, Expedia and TripAdvisor now offer services in Cuba. Since December 17, 2014, the Obama Administration issued six rounds of regulatory changes that eased travel and trade restrictions on Cuba. These policy changes have contributed to significant economic activity throughout the country, particularly in the U.S. travel, tourism and manufacturing industries. Additionally, as a result of diplomatic relations, the agreement between the U.S. and Cuba to end the policy known as "wet foot, dry foot," which granted permanent residency and federal benefits to Cubans who arrived by land to the U.S., will save U.S. taxpayers a significant amount of money and strengthen U.S. national security. Summaries of the major areas affected by potential rollback are listed below, totaling $6.6 billion and 12,295 jobs. Travel: U.S. travel to Cuba was liberalized over the past few years by expanding legal travel in 12 categories, self-authorization, and allowing both airlines and cruise lines to offer passenger service to the island. Rolling back expanded travel could cost airlines and cruise lines $3.5 billion and affect 10,154 jobs in those industries. Manufacturing: Manufacturing companies in the energy, chemical, and technology industries are finalizing commercial contracts that will create $929 million worth of exports from the U.S. to Cuba over the next four years. Revoking authorization for manufacturing exports would deal a blow of nearly $1 billion to American businesses and could cost up to 1,359 jobs. Remittances: Estimates on U.S. remittances to Cuba show that Cubans working in the United States send up to $4 billion back to the island every year. Over four years, cutting the remittance flow could cost American money transfer companies $1.2 billion and affect 782 jobs. Additionally, the increase flow of remittances has significantly helped Cuba's growing private sector. Immigration: In January 2017, the Obama Administration and Cuba reached a deal to end the controversial "wet foot, dry foot" policy, which granted permanent residency to Cuban immigrants who arrived in the U.S. by land. Because the policy granted refugees access to federal social and healthcare entitlements, reinstating it would cost U.S. taxpayers $953 million over four years. *Estimates do not include agricultural exports, which would bring the total to $8.1 billion USD and 14,500 jobs. *All estimates represent an accumulated cost over the four years of President Trump's first term. Engage Cuba is the leading coalition of private companies and organizations working to end the travel and trade embargo on Cuba. As a 501(c)(4) bipartisan non-profit whose funds are entirely dedicated to advocacy efforts, Engage Cuba is the only organization whose focus is U.S.-Cuba legislative advocacy. Engage Cuba is also committed to supporting the Cuban people and helping organizations and businesses navigate Cuban and U.S. regulations. The organization has the largest bipartisan lobbying operation working on U.S.-Cuba policy. Together with the Engage Cuba Policy Council of renowned experts, Engage Cuba provides timely updates on opportunities for U.S. business in Cuba, regulations, and market analysis. To get involved with Engage Cuba's mission or learn more, visit: http://www.engagecuba.org. Hoy, Estados Unidos está dando pasos importantes para normalizar las relaciones con Cuba y para lograr una mayor consistencia en nuestra política de inmigración. El Departamento de Seguridad Nacional está poniendo fin a la llamada política de "pies mojados / pies secos", que se puso en práctica hace más de veinte años y fue diseñada para una época diferente. Con efecto inmediato, los cubanos que intenten ingresar a los Estados Unidos ilegalmente y no califiquen para ayuda humanitaria estarán sujetos a deportación, de acuerdo con la ley de los Estados Unidos y las prioridades de su cumplimiento. 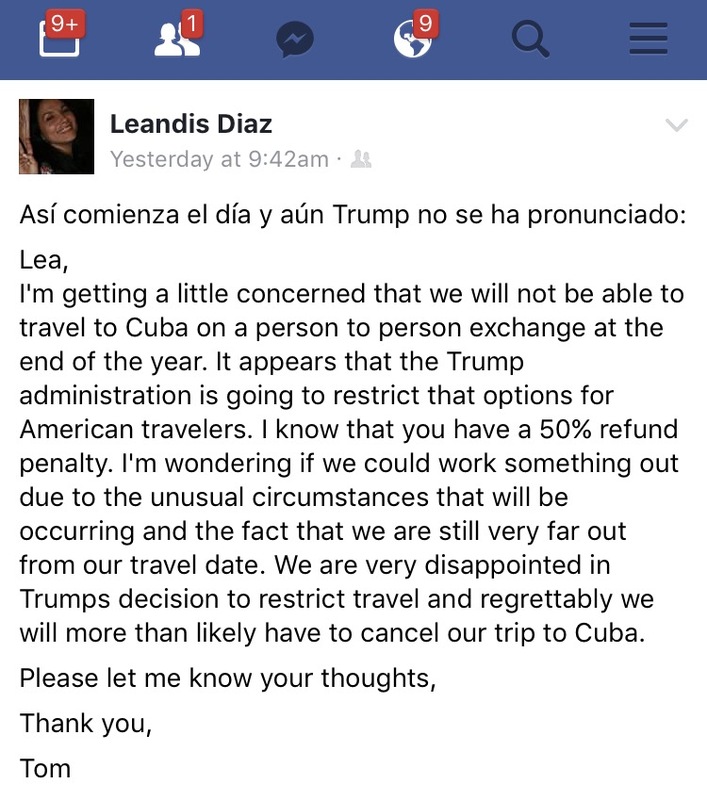 Al dar este paso, estamos tratando a los emigrantes cubanos de la misma manera que tratamos a los migrantes de otros países. El gobierno cubano ha acordado aceptar el regreso de los nacionales cubanos que tienen orden de deportación, al igual que ha aceptado el retorno de los inmigrantes interceptados en el mar. Hoy, el Departamento de Seguridad Nacional también está poniendo fin al Programa de especial de inmigración para médicos cubanos. Estados Unidos y Cuba están trabajando juntos para combatir enfermedades que ponen en peligro la salud y la vida de nuestro pueblo. Proporcionando un trato preferencial al personal médico cubano, el programa especial de inmigración para médicos cubanos contradice estos esfuerzos y corre el riesgo de dañar al pueblo cubano. El personal médico cubano ahora será elegible para solicitar asilo en las embajadas y consulados de los Estados Unidos alrededor del mundo, de acuerdo con los procedimientos para todos los extranjeros. Los Estados Unidos, una tierra de inmigrantes, se han enriquecido con las contribuciones de los cubano-americanos durante más de un siglo. Desde que asumí el cargo, hemos puesto a la comunidad cubanoamericana en el centro de nuestras políticas. Con este cambio continuaremos recibiendo a los cubanos mientras acogemos a inmigrantes de otras naciones, de acuerdo con nuestras leyes. Durante mi Administración, trabajamos para mejorar la vida del pueblo cubano, dentro de Cuba, proporcionándoles un mayor acceso a recursos, información y conectividad con el resto del mundo. Sostener ese enfoque es la mejor manera de asegurar que los cubanos puedan disfrutar de la prosperidad, perseguir reformas y determinar su propio destino. Como dije en La Habana, el futuro de Cuba debe estar en manos del pueblo cubano.